In many perplexing ways, the market's performance since the Global Financial Crisis has been unprecedented: starting with the deepest recession since the Great Depression, the subsequent bull market has been on an unprecedented run for the past decade, aided and abetted by trillions in central bank liquidity that have pushed global interest rates to historic lows, suppressed volatility and supported the S&P since its March 2009 lows so that there has not been a single 20% drop in the past 10 years, resulting in a 325% cumulative return and 17.7% annualized. Last September, the S&P's run became the second longest bull market in history. Then, during this year's January melt up, the S&P500 bull market became the 2nd largest of all time on Friday Jan 26th, when the index hit an all time high of 2873. 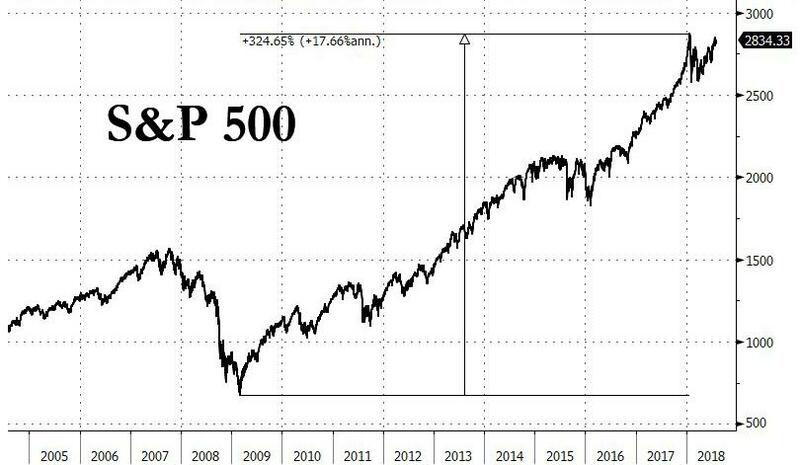 And now, Bank of America's Chief Investment Officer Michael Hartnett writes to "Get the champagne out For US stocks", because we are now just 14 trading days to go until the S&P 500 bull market becomes the longest of all-time, at 3,543 days, on August 22, 2018. 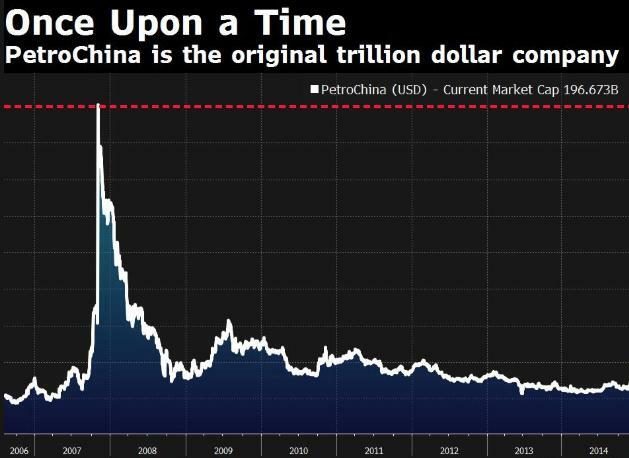 ... although it may serve as a bit of a warning to AAPL because by 2008, just one year later, the Chinese energy giant had lost $800 billion in market cap, from which it has never recovered. As Bloomberg's Heidi Lun notes, "that was the biggest destruction of shareholder value in history." Putting Apple's performance in context, DB's Jim Reid notes for the record that US Steel was the first to hit $1bn in 1901. It then took 54 years for GM to be the first to $10bn in 1955, another 32 years for IBM to reach $100bn in 1987 and now 31 years for the latest landmark. For the record Microsoft was the first $500bn company in 1999. 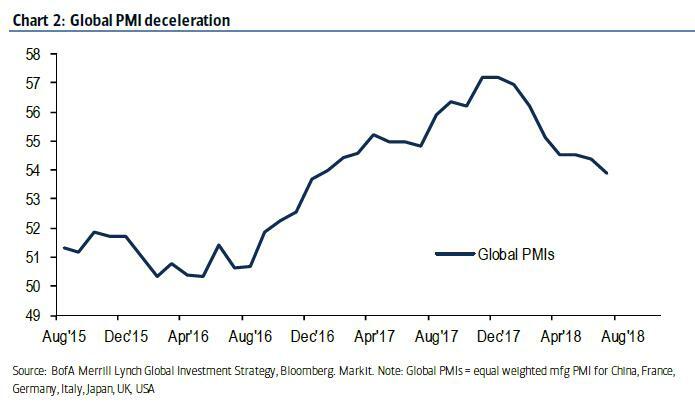 Peak Profits: the ongoing global PMI deceleration is driving EPS deceleration (23% to 17%). Meanwhile, Italy-Germany spreads (EU lead indicator), KOSPI/copper (China lead indicator) all suggest further global PMI deceleration in the second half. 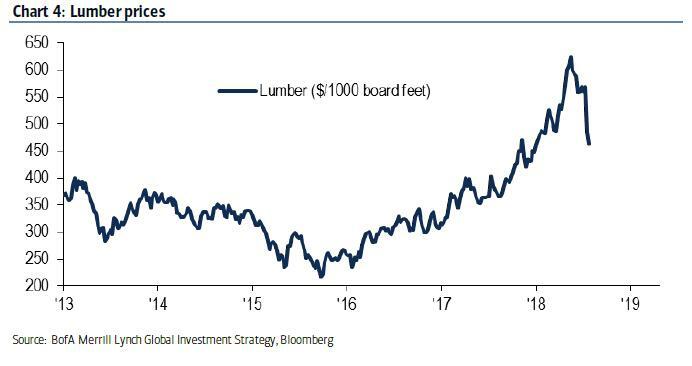 ... while the price action in US housing (lumber prices), hotels (MAR), casinos (WYNN), restaurants (MCD, CAKE) is inconsistent with US consumer boom (HD the ultimate tell). Then there is Peak Policy: Japan's shift in Yield Curve Control this week was another step from QE to QT, and as a result, central bank asset buying has been dropping sharply: from $1.60 trillion in 2016, to $2.30 trilion in 2017, to less than $0.17tn in 2018 (as described in The Central Bank Party Is Already Over). Meanwhile, returns outside of equities are already starting to reflect a potential slowdown: commodities 4.0%, US$ 2.8%, stocks 2.8% (ex. US tech global equities -0.8%), cash 0.9%, HY bonds -0.2%, govt bonds -1.6%, IG bonds -2.8%; as Hartnett puts it "Profits & Policy consistent with tougher 2018 returns." Still, while the longest bull market of all time appears to be generally in the books, will the S&P also then follow up with become the greatest bull market of all time in percentage, which would happen should it hit 3,498 on the S&P500. A speculative bubble from a Great Rotation out of negatively yielding debt into stock markets. 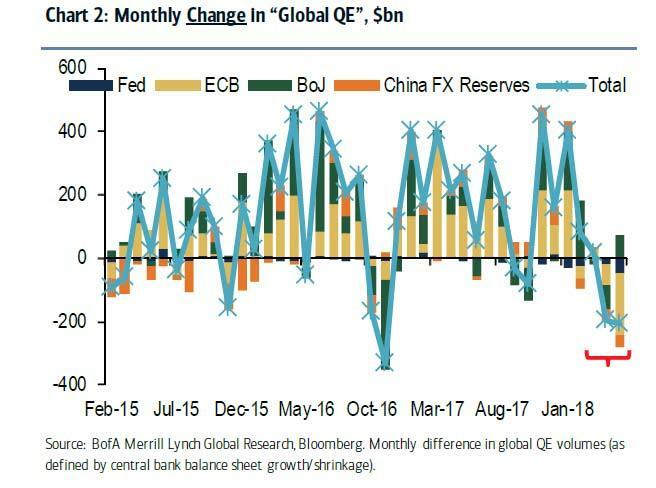 While the first is unlikely, central banks are doing everything in their power to accelerate that one final rotation. 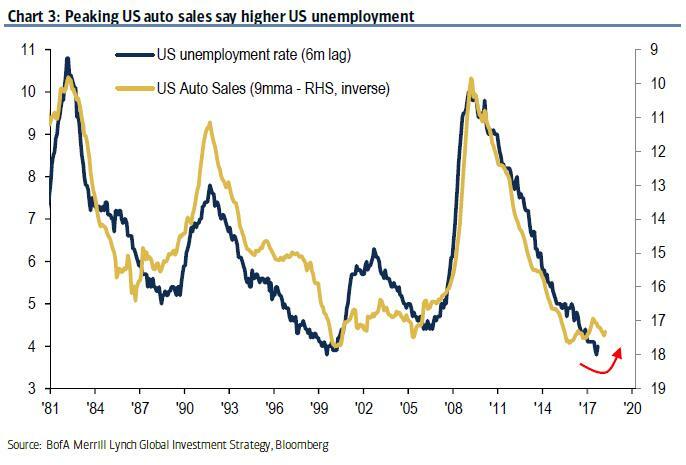 In the meantime, the bigger question is whether the Fed itself will not kill what will soon be the longest bull market on record: recall that "bull markets don’t die of old age, they die of recessions and economic slowdowns"... but they also die of excessively tight monetary conditions, in other words a "market event" spurred from the Fed itself. 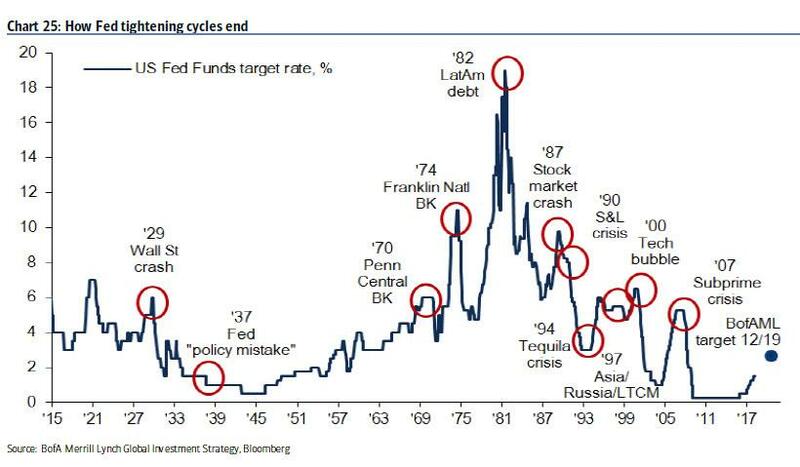 Or as Deutsche Bank puts it, "every Fed tightening cycle creates a meaningful crisis somewhere." 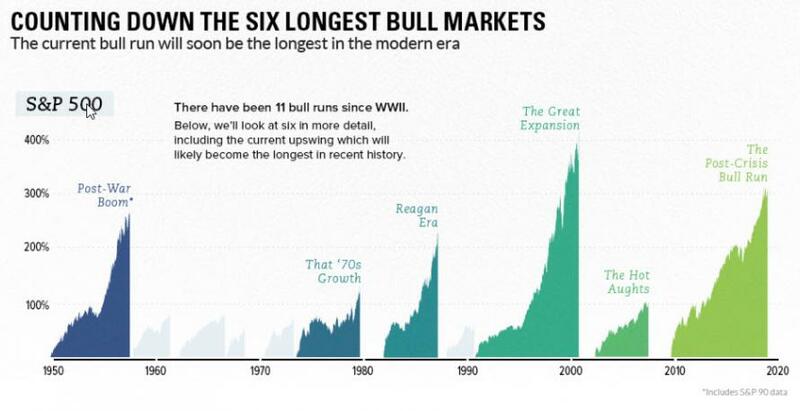 Until then, here is a chart from the Visual Capitalist counting down the six longest bull markets of the modern era.